There is a lot more to British musician Gary Numan than his 80's mega-hit "Cars". That's what our intrepid Dark Starr found out, after speaking to him recently. Numan has a strong new album "Pure", which might shock people who think of him as strictly a New Wave guy stuck in about 1984. For example, those who know him for only his early 80's work might be surprised to find out how much he is into Marilyn Manson and the Deftones. This is one guy who is not content to rehash the past. The Wormwood Chronicles: The new album seems to have a lot of the elements of your earlier music, but with a harder, darker texture. How did that come about? Gary Numan: It's actually the third album since the direction I was taking brought me to a much heavier and much darker sound. The first one came out in 1994. The way it came about is, when I first started writing, I was really searching for sounds all the time, and I used to try to be really quite creative. I think what happened was, when I had some success, it was good for the first two or three years, but then it all started to slide away from me. I didn't really notice when it happened, but over the years, as the ages progressed, the reasons for writing songs changed, and I think I got lazy, and I stopped searching for sounds. I spent quite a few years just trying to write songs that would get me back on the radio. Really, I was kind of in a survival kind of situation, where I was trying to keep the career alive and keep it going. So, I started to write songs for commercial reasons, and then things got worse and worse and worse. So, I did an album in '92 that was called "Machine of Soul" that was probably about the worst album I've ever made. It was at the end of that that I had a really serious rethink about everything to do with why I was in the business and why I was writing and if I wanted to carry on doing it, and so on. I went back, as much as possible, to writing songs for fun, the way I had when I started, and started looking for sound again. I just went right back to the way I was when I was a teenager, first time writing songs, with all the enthusiasm for it. I started trying to be innovative again and using sounds in more interesting ways than I had been doing. So, what you're saying makes a lot of sense in that the way I'm writing now, and have been for the last few years, is very much the way I wrote when I first started. It¹s the bit in between that got a little bit misguided. WC: How has the new album been received? Gary Numan: It's been fantastic. This is, I think, my 17th or 18th album. I can¹t remember for sure, and I've had the best reviews on this one - ever - including when I was doing much much better in the early Œ80¹s. So, from that point of view, it's been a real relief. It's not a particularly commercial record. There's not a long list of songs on it that you could take off of it that would make really, really great radio singles. It's pretty heavy and it's prety dark. Some people have said, "maybe this isn't the right album at this particular time." I disagree with that. I think it is exactly the right album for me to be making at this particular time. I was always worrying about commercial success before, and it pretty much finished me off. So, I'm not going to get into that way of thinking again. WC: The sound on the new disc seems to remind me a lot of the more sedate portions of newer groups like Korn and Marilyn Manson. Do you see yourself influenced by them or do you think that you have influenced them or is it more of a mutual independent discovery? 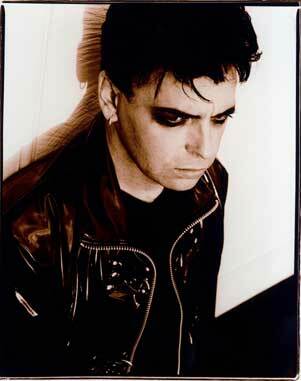 Gary Numan: It's really hard to say. Sometimes where an influence comes from, and whether it¹s really clear in your mind when you're doing something; or whether it's something that you heard years ago and forgot, but, it comes out nonetheless in songs you write... It's really hard to say. Marilyn Manson and Trent Reznor and people like that have said, on a number of occasions now that I was influential in what they've done. It's fantastic for me that they said that. I¹m very flattered by it, but you wouldn't really notice it too much - I don't anyway - in the music that they¹ve made. So they've taken the influence and (have) done something really constructive with it. I think at the moment that I'm kind of feeding on things around me that I find exciting. It's as simple as that really. I¹m a long term Nine Inch Nails fan. I've always been a big Deftones fan. I love what Manson's doing. Marilyn Manson did one of my older songs some time ago, before I even heard of him. I'm not into the pop scene at the moment. The whole way the chart's developed over the last few years, I think it's become really puerile, and it offers me nothing whatsoever. So, a lot of what I do is just reaction against that, regardless of where the influences are coming from, but by doing that I've discovered a whole new range of music, particularly when I was on tour here in '98. I was out with Trent Reznor on that tour, actually, and Marilyn Manson came on stage with us at one gig. I was just introduced to a whole range of music that I hadn't really been aware of before. That had a big effect on what I was doing with this one, because I was sort of learning as I was writing. I was learning all the time how to do it, and how to do it better. I really think the album is just one in an ongoing series of records. I think the next one is going to be heavier and darker, more aggressive. I still really do feel like I¹m learning. So, I'm kind of listening to everything I can get my hands on. The influences are probably all over the place. WC: In many ways you sort of personified the '80's electronic/new wave persona. Was there ever a sense of that for you, and if so, how does that relate to where you are today? Gary Numan: At the time I had no idea at all. I'm not glowing with confidence with what I do. When I'm in the studio, I'm often really worrying about what I'm doing and never really sure that I'm getting the best out of myself. I often write far more songs than I need because I'm still trying to write better songs. So, I don't just sit there thinking, "oh this is gonna be this and this is gonna be that." All I¹m sitting there thinking is, "I hope to Christ it's good enough." I really am worried, constantly. I am a worried studio person. So for me to be finding out now that these people have been saying these things about my influence and sound, it's been a big surprise to be honest. It's quite an amazing thing, it really is. All I can remember is sitting in the studio, just being worried and desperately, trying to make the album that¹s better than the last one. All I could hear was what is wrong with it. I look at all my mistakes with every album I¹ve ever made and try to learn and try to move forward. I never once sat back and thought I was being clever or anything special. I look around at other people constantly from the first album I ever made right up to today. I just look at people and think how talented they are and how innovative people around me are. I just try to keep up really. WC: What do you think of people like Fear Factory covering your music? Gary Numan: It was great. It was really, really great. I was kind of a fan anyway. Actually, to be honest, when it first came along, and they fist asked me to get involved with it, I was slightly worried about it because it was "Cars" again. I thought people were gonna think, ³Oh God, it¹s Gary Numan, he¹s only ever written one song and he¹s flogging it to death", but then I thought it might be a really good opportunity to introduce my name to a new generation of people that probably haven't hear of me before. With the fact that it was Fear Factory, it was actually going to be a much heavier version than any other version that had been done of it. I thought it was worth taking the risk. The thing is, with somebody in my position that's been around such a long time and has only really had that one hit, I have to be really careful. I wouldn't want to be seen as just using that one song all the time and constantly living on past glories. I think that's a really bad way of trying to move a career forward. For me, I thought that there was kind of a risk attached to it. That it could backfire, and people could just think, "Oh God, nostalgia," but it didn't. Overall, I think it worked really, really well, and I really got on with the band. I really, really liked them a lot. Then it got me back to doing video, which was really, really cool. The last time I was in London, when they played at Brixton, they invited me onstage when they did "Cars," so that was really cool. It was a really good experience, and I'm really glad I did it. WC: We've already talked a bit about musical influences. Who would you see as some of yours? Gary Numan: Well, when I first got into electronic music, I used to listen to Ultravox a lot. They were the only people really who were doing things where they mixed synthesizers – electronics – with conventional instruments, and that's what I wanted to do. I didn't want to replace old instruments the way people like Kraftwerk had done – with just all electronic. That kind of didn't work for me. The things that Bowie and Eno were doing were kind of not really what I was after either, but Ultravox were. Ultravox were very much in the same sort of vein. So, I listened to them quite a lot. Before that, I really wanted to be a pop star/rock star because of people like T Rex and Marc Bolan and so on. I was a Bowie fan for a while, but not for that long. More recently, over the last five or six years, I guess – well, I've been a Nine Inch Nails fan for a long time. I love Nine Inch Nails, Marilyn Manson, Deftones. At the moment, I think Snake River Conspiracy are really cool – really into that. Actually I don't think there's any of the people that I liked when I was first writing songs – I don't listen to any of it now. The tastes I've got have just changed over the years. I tend to listen to things that I can learn from. So, whatever kind of music I am trying to make at the time, I listen to things I can learn about that. So, to me listening to albums is almost like going back into the classroom. I'm studying all the time on how to do it. WC: It seems that one of the curses of being a musician is that it is hard to just listen to music. You are always sort of breaking it apart, analyzing it. Gary Numan: It's hard to avoid that isn't it? You're forever thinking, "that¹s a good snare drum" or "that's a cool bass sound - wonder how they got that." Before you know it, the song¹s finished and you're still trying to figure out how they got that bass sound, and I'm just like that with everything really. My wife listens to stuff. We're listening to the same track and instead of saying, "oh, that¹s a great song," I¹m going, "that's a great reverb on the snare." And, she's going, "what are you doing?" I just can't help myself. WC: Are there any musicians with whom you would like to work? Gary Numan: Well, actually the last few times I met Trent Reznor, Trent talked about doing some writing together. I'd love to do that because I'm a big Trent Reznor fan. I met Billy Corgan a couple times in London recently. He said a similar thing, that he like to do something later this year. So, again, that would be really cool. Afrika Bambaataa – I actually was talking to them early part of last year about doing an album project that he was coming out with and he wanted to work on one of my songs, too. I think Nine Inch Nails has just done the same song. So, I¹m not sure that's still going to happen, but, again, that would be cool. Gary Numan: I've got more Spinal Taps than I can count. We used to have these three columns that were in the roof of the light show. They were about 4 feet wide and about 16 feet long, and they would just lay along the roof. They lit up in these different colors. They were like solid structures. At some point during the show they were on remote and they were actually lowered down, and they would then come onto the stage. You'd have these three giant columns, kinda like a sci-fi coliseum. That was the idea behind it anyway. Then one particular night, as they came down, one of the road crew had laid on the back of it. We used to have these two girl singers in the middle of the stage at the back. So, the audience couldn't see it, but as this thing came down, this man was on the back of it, completely naked. The only people who could see him were these two girls who just freaked out completely. Most funny thing you¹ve ever seen. That was good fun. Dark Starr: What was the last CD you bought? Gary Numan: The last one was Snake River Conspiracy, or it may have been Marilyn Manson – one of those two. I've been listening to those two a lot. Dark Starr: What was the last concert you attended? Gary Numan: Marilyn Manson in London.